Meet FACE partner Rebecca Shaffer, Marketing Associate at the San Diego Veterinary Specialty Hospital’s North County location. Rebecca has been with VSH since February 2012, and has enjoyed partnering with FACE to save the lives of many pets in need of critical veterinary care. For Rebecca, FACE means hope. “Pets are family,” she says. “It is devastating when you are unable to afford lifesaving veterinary care. 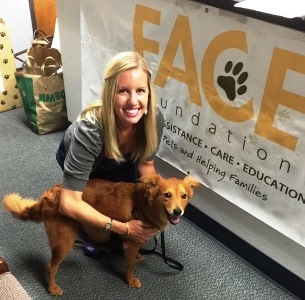 FACE allows pets to be treated and gives them a second chance at life, preventing them from facing euthanasia if it is not necessary.” A strong believer in our mission, Rebecca loves working with FACE. “It is an honor to work with such a great organization,” she says. “They care not only about the pet needing help, but the family as well.” What’s Rebecca’s most memorable FACE case? FACE has partnered with VSH on so many cases, it’s hard for her to pick just one. One that does stand out is a sweet and adorable 5 month old Boxer named Rebel. “Rebel was transferred to VSH for a possible foreign body. He had surgery with Dr. Seth Ganz, who ultimately found the foreign body was a squeaker from a toy!” Rebecca is happy to report Rebel made a full recovery and is doing great. Rebecca is an avid equestrian and spends her time away from VSH training, competing, and working with her horses. Besides an Arabian horse named Aly and a Morgan horse named Bella, Rebecca cares for a whole menagerie of animal companions, big and small, including two Chihuahuas named Bambi and Tinkerbelle and two Nigerian Dwarf goats named Tigger and Snuggles. Passionate about horses and riding since she was a little girl, she got her first horse at age 13. “The bond you can have with horses is indescribable,” she say. “You put a lot of trust in them to ride them, and they do the same to allow you on their back, and in turn it creates a deep connection between the two of you.” Rebecca enjoys her work with the pets and clients who come to VSH. “I love seeing the quality of medicine we are able to provide to them,” she says. Rebecca recommends that more animal hospitals take advantage of FACE. “FACE can be an option for people when there are no options left,” she says. FACE thanks Rebecca Shaffer and all of the dedicated team members at the Veterinary Specialty Hospital for all they do to save the lives of pets in urgent need of treatment.